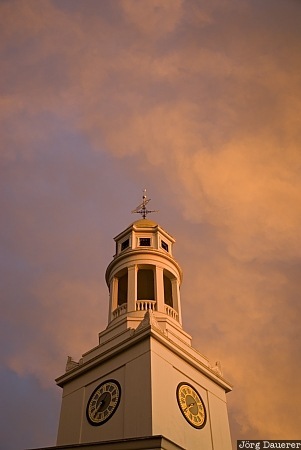 Colorful sunset clouds behind the tower of First Parish Church in Concord. Concord is in the eastern part of Massachusetts, United States. This photo was taken in the evening of a rainy day in May of 2010. This photo is part of the exhibition Towers (February 2011). This photo was taken with a digital camera.